Isiah Factor | The Insite » A FAMILY THAT PRAYS TOGETHER! A FAMILY THAT PRAYS TOGETHER! 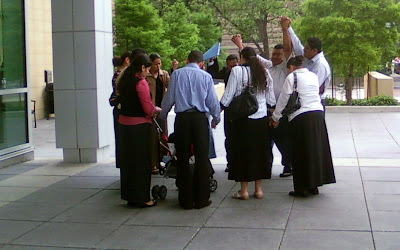 April 30, 2009 | Posted in Uncategorized | Comments Off on A FAMILY THAT PRAYS TOGETHER! They were loud, bold and speaking in Spanish. The only thing I understood they were saying was thank you lord. They repeated it over and over again. It was a family standing in a circle while holding hands outside of the Harris County courthouse. One woman had what appeared to tears of joy rolling down her face. I’m nosy and curious. So when they were done I approached a man who was carrying a leather bible in his hand. I asked him what they were praying about. The man said the woman had lost custody of three children after someone made allegations against her. The man went on to say the woman got her children back after a judge ruled in her favor. Then the man said God is good, smiled at me and walked away. The end!